The good people over at Mountain Dew and the NBA is presenting a dope event in the ATL for fans that enjoy the refreshing pop and the game of Basketball with its premiere of the DEW NBA 3X Tournament at Atlanta’s Prive. It’s an exciting time for the NBA fans and players; the NBA and Mountain Dew have announced the league’s first-ever nationwide elite 3×3 basketball competition tour. The Dew NBA 3X is making its first stop in the ATL for its tour that will cover six NBA markets from May to October, men’s and women’s championship teams will qualify for the 2017 USA Basketball 3×3 Tournament. 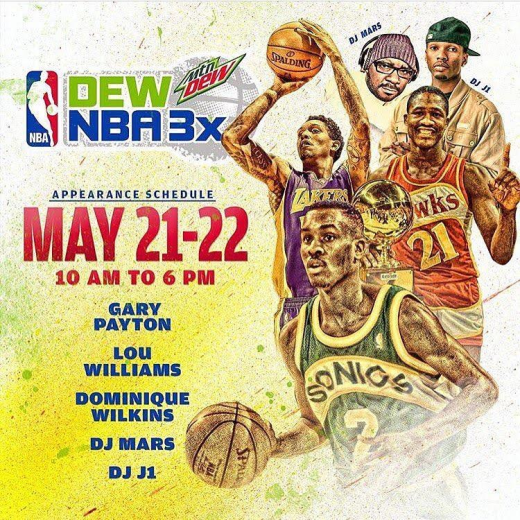 The Dew NBA 3X Tournament is more than a basketball tournament, the weekend events will also feature fan-friendly entertainment, including skills contests, celebrity appearances from personality India Love and Dew NBA 3X Ambassadors Dominique Wilkins, Lou Williams, just to name a few, and celebrity DJs, food trucks and more. Hall of Famer Gary Payton, a Dew NBA 3X Ambassador, will appear alongside local NBA players and legends, all of whom will interact with fans. More than 30 preselected men’s and women’s teams will be invited to each Dew NBA 3X competition. Each two-day event will begin with pool play and be followed by a single-elimination playoff bracket, resulting in a city champion. The winning teams from each city will then meet in Los Angeles for the championship event. Both the men’s and women’s winning teams from the Dew NBA 3X Finals will qualify for the 2017 USA Basketball 3×3 National Tournament. In addition, the winning teams from the Atlanta competition will qualify for the 2016 USA Basketball 3×3 Tournament in August in Colorado. The winning Dew NBA 3X men’s team will qualify for two additional events: the 2016 FIBA 3×2 All Stars in November in Qatar and a 2017 FIBA World Tour event. This event is going to be EPIC! The only thing you have to do is RSVP to gain access to the event. I know yall know how we get down so understand that you must RSVP to gain entrance in the event. So RSVP by clicking the link here. A RSVP confirmation will be sent by 8 pm on May 19th. Your attendance is not confirmed without receipt of the RSVP confirmation e-mail. EXCLUSIVE: Legendary Dominique Wilkins Celebrates his Birthday with Family and Friends ! Breaking NEWS: NBA Bans LA Owner Donald Sterling for LIFE!